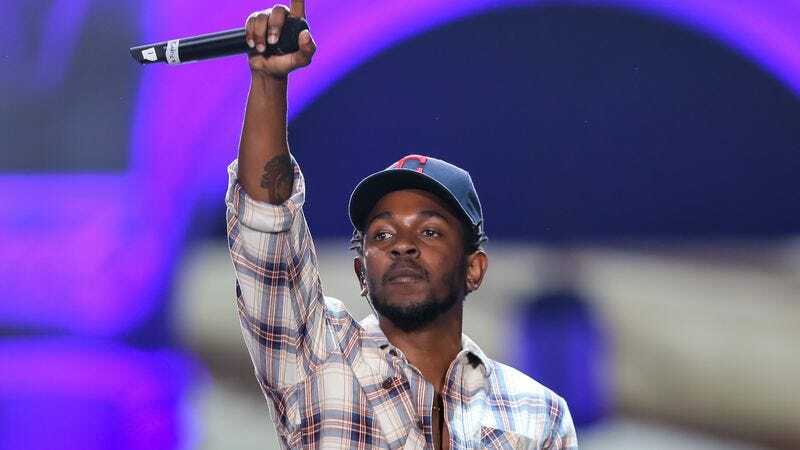 The nominees for the 2016 Grammy Awards were announced Monday morning, and Kendrick Lamar leads the musical pack with 11 nominations, including nods for Song Of The Year and Album Of The Year. The Weeknd is in second with nine nominations, and Alabama Shakes and Taylor Swift tie for third place with six nominations apiece. All four of these frontrunners will compete for Album Of The Year, but only one of them made it onto The A.V. Club’s best albums of 2015 list. Elsewhere, Swift will try to best her pal Ed Sheeran for Best Pop Solo Performance, and is partnered with Lamar in the contest for Best Pop Duo/Group Performance. Wilco’s Star Wars has entered the Best Alternative Music Album fray along with Tame Impala and Björk. Family Guy’s Seth MacFarlane is up against Josh Groban and Bob Dylan in the Best Traditional Pop Vocal Album category, because that’s a thing that happens these days. And the Best Music Film category pits Foo Fighters’ Sonic Highways against the Netflix documentary What Happened, Miss Simone? And in case you were wondering, Adele’s 25 was released too late for consideration in the 2016 awards show. We have some more notable categories and nominees for you below, but you can find the complete list here. The 58th Annual Grammy Awards will air on February 15, 2016 on CBS at 8 p.m. ET.